My scholarly carrier has been dedicated to understanding and writing about the arts of working-class people, especially the material culture of Italian immigrants and their descendants. With my academic training as a folklorist I have paid serious attention to the aesthetics and social dimensions of women’s embroidered cloth, religious architecture, and the singular genius of the likes of Sabato Rodia and his fantastic Watts Towers. I have helped arrange for the creative works of Vincenzo Ancona and Giovanni Indelicato be permanently placed in safe and appreciative museum settings. In addition, I have assisted in the process of listing the Lisanti Family Chapel and the Our Lady of Mt. Carmel Grotto in New York City on the National Register of Historic Places. My dedication to this scholarship and cultural activism has caused me to wake from joyful dreams in which I discover some heretofore unknown work of folk or self-taught art. I’m lucky to say that my dream came true again. Last month, I had the good fortunate of meeting Joseph “Chris” Crozzoli at his New Jersey home to see the marble tower that sits in his front yard. This piece—a scaled-down version of one of the two towers in Bologna—is one of several works made by Chris’s grandfather Giovanni. Chris took the time to tell me about his grandfather’s life and artistry. Giovanni Crozzoli's house (right), 2008. Photo by Joseph Crozzoli. Giovanni Crozzoli was born in Tramonti di Sopra (Pordenone province), in the northern region of Friuli, in 1894. He served in World War I as an Italian Alpini solider. (He collected a pension for his service from the Italian government up until at least 1940.) 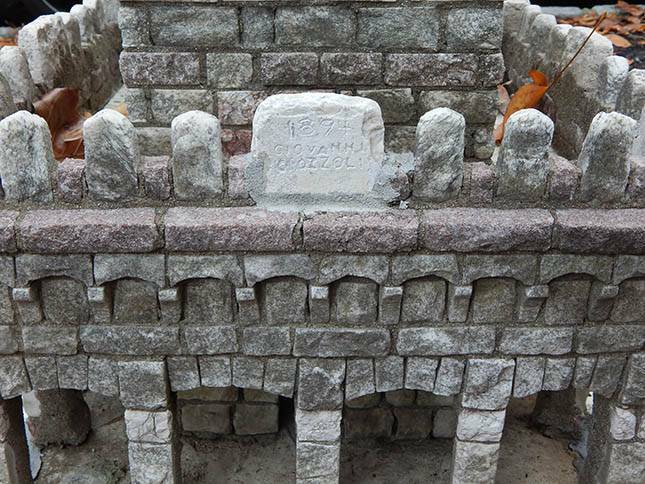 After the war he built a stone shrine/memorial in his town road to his brother Vittorio who died in the 1916 Battle of Gorizia (also known as the Sixth Battle of the Isonzo). He arrived at Ellis Island on July 1, 1923 and after six years brought over his wife Anna and their sons Vittorio and Marino. After the family’s reunification he bought a house at 1831 129th Street in College Point, Queens, which was owned by the family until Vittorio died in 2013. Left: Crozzoli's union book, 1924. 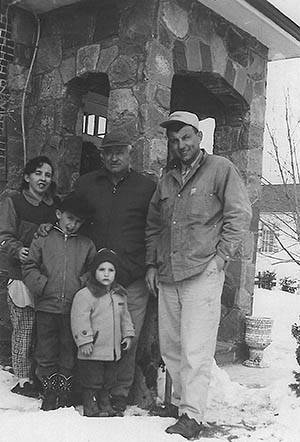 Right: Crozzoli (center) with family members with stone entrance way of upstate New York house he built, circa 1956. 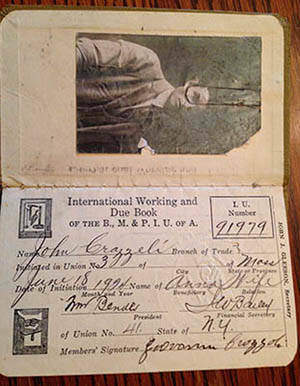 The 1923 ship manifest listed Giovanni as a bricklayer and indicated that his final destination was Boston. Less than a year after arriving he became a member of the Bricklayers, Masons, and Plasterers International Union of America. In New York City, Giovanni worked until his retirement as a mason for Facchin and Son Construction, a College Point company owned by a paesano. Giovanni Crozzoli standing with his towers during the 1930s. It was the work that Giovanni did during his off hours that brought me to Chris’s New Jersey home. Chris told me that during the Depression his grandfather collected discarded chunks of marble from a neighborhood company and chipped away to create tiny bricks. In addition, to the two towers from Bologna, he also created the Leaning of Pisa, and a castle. The Pisa tower originally stood in the front yard and was eventaully moved to back yard. 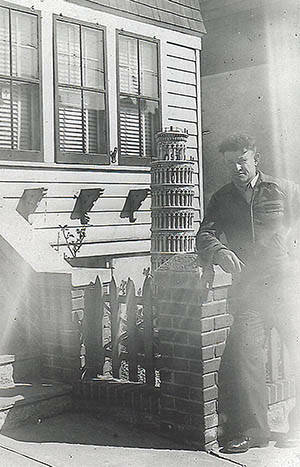 The second, shorter Bologna tower currently sits in the front yard of a College Point house and Chris speculates that his grandfather gave or sold it to a paesano. Giovanni died in 1966. When Chris’s father died in 2013, the family sold the house but he wasn’t going to leave behind the towers. 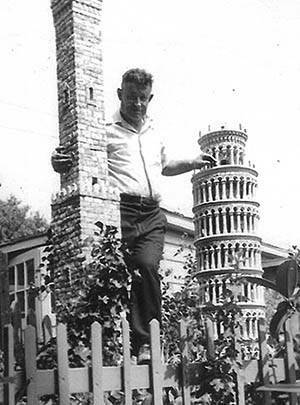 With help of friends, he dismantled the tower and carted it to New Jersey, while his brother Victor hauled the replica of Pisa’s campanile to Long Island. Chris Crozzoli preparing the dismantled tower for moving. But these works are not all that Giovanni Crozzoli created in the United States. Here’s a photo of him working on a shrine that he built for an unidentified church on Long Island. And then there were the decorated flowerpots, but that’s for another blog. Stay tuned.